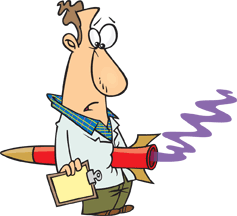 You don't need to be a rocket scientist to learn bookkeeping and accounting ! Welcome to Bean Counter's free online Bookkeeping and Accounting Training including Tutorials, Courses, Lessons, Tests, Exams, Quizzes, Lectures and Guides. Free online accounting and bookkeeping training, lessons, and help and guidance is on the way, and no you don't have to be a rocket scientist to learn bookkeeping! Although my free interactive online bookkeeping and accounting tutorials and courses are slanted to the United States, bookkeeping and accounting are basically the same regardless of where you are located. We just have different currencies, the dollar, pound, yen, and so forth. So, individuals from other countries can also benefit and be helped by my free online accounting and bookkeeping lessons. Just mentally substitute your currency symbol anywhere that I've used the US Dollar Sign ($). In a nutshell, my site Bean Counter is primarily an accounting and bookkeeping educational and training site that offers free beginning bookkeeping and accounting tutorials, courses, exams, tests, quizzes, lectures, and games with a dose of humor injected. Don't let the cartoons fool ya! This site is all business; but, it doesn't hurt to have a few laughs and smiles included. The focus of this educational and learning site is on learning double entry bookkeeping and accounting. If you want to learn bookkeeping or how to do bookkeeping, you've come to the right place to find the bookkeeping and accounting courses, training, lessons, guidance, and help that you need to learn the basics of bookkeeping and accounting. If you're anything like me and consider your time precious, when I do a search for a topic and go to a site I want to quickly determine if the site has any useful information, products, tools, etc. that will benefit me and be worth my time to browse. Watch MY Site Tour Video to quickly determine if my site might provide the bookkeeping and accounting courses, training and help you need. On my site Free means Free. Unlike many other sites, there is no paid membership area and you have full access to all my online bookkeeping courses, lessons, video lectures, games, and quizzes. Of course I'd be grateful for a donation or an ebook purchase of my tutorials to help support my site; but, neither is required to acess all my online courses and materials. That's a decision left strictly up to you. I am a tired and retired small business consultant. The biggest problem I faced was that business owners didn't understand anything about their accounting. The worst part is they were too embarrassed to admit it. Your work is some of the best I have seen to explain it simply and comprehensively. Even a professional could learn a thing or two by studying your work. Congratulations and continue the terrific work. I can't tell you how long it's been since I enjoyed visiting a website so much. I was looking for some freebie bookkeeping tips (college accounting was five years ago and I haven't used it since!). I found exactly what I needed on your website and MORE. Everything is extremely well-written with good use of white space, and graphics that compliment your personality and set a positive mood. I will be recommending your site to friends and acquaintances who might be able to use your services, and I will be contacting you as my Avon and child care consulting businesses grow. If you ever need a testimonial for your site, I'm your girl! Awesome site! Every once in a while I find a little treasure on the 'net...and your site is one. I am sitting in my office, having had a good chuckle from your joke section and youtube introduction. I am also thinking that I really appreciate the time and effort you put into your creation...especially the humour. My site provides a bunch of useful information, training, and help about beginning accounting and bookkeeping, even if I do say so myself. Don't believe me ? I wanted to personally thank you for putting together this excellent resource on the introduction to accounting and bookkeeping. Clearly you’ve invested a tremendous amount of time thinking about and developing the content. I really liked your cartoons (they make fantastic top-level bullet points). As a start-up business owner I feel it’s absolutely critical to understand the basics of accounting and bookkeeping in order to build a sustainable business; I did not go to business school, but having spent the time to review and understand your material will help me build a better business. Your site has given me some excellent insight into the accrual method and how it is superior to the cash method, in terms of detailing the actual current financial state of the business; excellent example between cash method and accrual method (false income/expense reporting with cash method). I will be supporting your efforts! I just want to tell you how much I have enjoyed your site. There are many tutorials on the web about bookkeeping but none have touched what your site covers. I hope your site reaches everyone looking to learn bookkeeping skills. Thank you for the time and effort you have put in the free lessons. I purchased your bookkeeping practice course and it made everything make sense. You should offer paid lessons on Udemy. There are lots of bookkeeping courses on there but not even close to what you offer! See what more users have to say. In a hurry or pressed for time ? I realize you're a busy person so why not add my bookkeeping site to your favorites and browse my site as your time permits. What is a bean counter ? 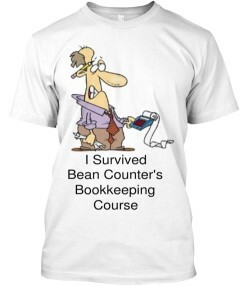 For those of you that don't know, the term bean counter is slang for a bookkeeper or accountant. Let's also define accounting and bookkeeping. Watch my short video presentation about accounting and bookkeeping. Bookkeeping is one of the components of accounting. Think of accounting as the mom and bookkeeping as one of her children. Bookkeeping is the process of recording and classifying business or personal financial transactions into a usable form that provides financial information about a business or individual. What makes bookkeeping work ? Short video of what makes up a bookkeeping and accounting system. Why are accounting and bookkeeping important ? Watch my short video presentation about why accounting is important. and yes you can teach an ole dog new tricks. Owners and managers of small businesses who either need a quick review (refresher courses) or who need to learn the basics from the ground up. You don't actually have to do the bookkeeping but you do need to at least be familiar with the terminology and what's involved so that you can intelligently analyze and discuss your financial situation with your bookkeeper, accountant, banker, etc. In addition, you'll also be able to prevent being "snowed" by your bookkeeper. Students, high school or above, taking bookkeeping or accounting courses and having a difficult time grasping the concepts and material or understanding the instructor or teacher. Teachers and Educators who are looking for additional material to compliment the lessons from their accounting textbooks and lectures. Bookkeepers and others currently performing accounting and bookkeeping tasks who need a refresher course or need to learn the whys of what they are doing. Many organizations, national as well as local, such as SCORE and others want small business owners to succeed and provide free consultation, tools, and other information to help. If your'e one of these organizations, consider utilizing my site as one of your tools by providing a link to my site. The accounting courses provide individuals responsible for accounting and bookkeeping training material that can be used as an additional tool used to help educate their employees about the basics of bookkeeping and accounting. OJT (On The Job Training) is fine; but, it doesn't hurt to provide some additional material to aid in providing employees with the knowledge necessary in order to properly perform their assigned tasks. Good accounting and bookkeeping software help to simplify, automate, and speed up the bookkeeping process. In this day and age, I recommend that even small businesses use accounting software. That being said, some time does have to be invested in order to learn how to properly use the software. While, the good programs actually don't require a lot of accounting and bookkeeping knowledge, it's still beneficial for those that use the programs to also invest a little time to learn the basics of bookkeeping. Whether your preparing for a new job, just need a quick refresher, or have other reasons to learn about the basics of bookkeeping, this course is for you ! I promise to try not to bore you or put you to sleep.To view or take any of the accounting and bookkeeping courses just select the course from the main menu or click on the links to the tutorials provided throughout my site. What Accounting and Bookkeeping Courses Should I Take and In What Order ? It depends. Boy, I copped out on that answer didn't I ? Well it really does, because to properly answer the question depends on what you already know about bookkeeping and accounting and why you need or want to take the tutorial(s). For true beginners (newbies) , you should begin with the the Introductory Bookkeeping Course - So, you want to learn Bookkeeping!. I also recommend that after completing the introductory bookkeeping lessons, that you add to and reinforce the accounting and bookkeeping knowledge that you've acquired by taking the - So, you want to learn Bookkeeping! - Chart Of Accounts and Special Journals tutorials. These three tutorials should provide you with a good basic understanding of bookkeeping and accounting and the records used. If you're using bookkeeping or accounting software (which I hope most businesses are) , it will also enlighten you as to what is actually taking place behind the scenes when you are entering data. The other three accounting courses, Inventory, Payroll, and Cash can be taken in any order that you want and depend on you. If you work with or need to know about inventories - take the Inventory Course. If you work with payroll or need to learn about the government's laws and regulations - take the Payroll Course. Lastly, I do recommend that everyone take the Cash Course since cash along with profits are major keys to the success or failure of a business. The Cash Course also provides you with a free Cash Forecasting Template. Owners and managers need to begin with the Introductory Bookkeeping Course, and in addition take the Cash Course. These two courses will at least give you a "working knowledge" of accounting and bookkeeping concepts and also show you why cash is critical to the success of a business. While the other courses are optional, I reccommend at least browsing thru the additional courses. For those taking bookkeeping and accounting courses, select the tutorials that will provide you with a review of what you've studied in class. If you just need a bookkeeping or accounting refresher course, skim thru the Introductory and Special Journals Tutorials and select any of the other bookkeeping courses that you want or need to bone up on. My free So, you want to learn Bookkeeping! Introductory Bookkeeping Course introduces you to beginning bookkeeping and my style of presenting information. In other words, this online bookkeeping course is designed for beginners (newbies) and provides an introduction into the world of accounting. This tutorial can also be used as a quick bookkeeping refresher course for those wanting to brush up on their bookkeeping basics. Topics covered include accounting and bookkeeping terms, the accounting equation, double entry bookkeeping, debits and credits, business transactions, general ledger and journals, financial statements, and more. I'm currently in the process of creating a new updated version of this tutorial and I'm about 99% complete ! I still need to maybe add more quizzes, additionl videos, and review all the lessons for content. Your comments and recomendations would be appreciated. In the future, I may require a small fee (notice I said small) for this Updated Version. Get it while it's still free ! The Introduction discusses the types of business organizations, types of business activities, users of financial information, bookkeeping systems, accounting rules, and the cash and accrual basis of accounting. Lesson 1 The Bookkeeping Language introduces you to some of the terminology and definitions used in the accounting and bookkeeping language. Lesson 2 Property and Property Rights explains Property & Property Rights, the Accounting Equation, Double Entry Bookkeeping, and how business transactions affect the accounting equation. Lesson 3 Debits and Credits introduces and explains Debits and Credits and how they affect the Accounting Equation and are used to record business transactions. Lesson 4 Recording Business Transactions explains and uses examples to illustrate how business transactions are properly analyzed, recorded, and summarized. Lesson 5 The General Ledger and Journals explains what General Ledger and Journals are, how they're used, and what bookkeeping purposes they serve. Lesson 6 Financial Statements explains what financial statements are, how they're created, and how they're used. Lesson 7 Review of Major Concepts reviews the major definitions, concepts, and bookkeeping records previously discussed and necessary for an understanding of bookkeeping. In addition to my Introductory Bookkeeping Tutorial, I've written some additional accounting and bookkeeping courses for those of you wanting or needing some additional bookkeeping and accounting education. If you need to expand your bookkeeping knowledge, you need to check out these additional free accounting tutorials. Additional accounting and bookkeeping topics covered include cash, chart of accounts, special journals, inventory and payroll. The special journals tutorial and course introduces and explains what records are required to properly record and classify business transactions. Records discussed and explained include the General Ledger, Control Accounts, Special Journals, and Subsidiary Ledgers. The payroll tutorial and course provides an introduction and overview of payroll and the laws, rules, regulations, forms, records, and calculations that small business owners and/or their employees responsible for payroll need to be familiar with. While all the same materials presented in my Accounting and Bookkeeping Ebook and CD Versions are presented for free online, I do offer my Ebooks and CD Versions for those who want to study offline, print out a hardcopy, and also acquire a handy accounting reference book. Your purchase benefits us both. A good "deal" is when everyone wins. You win by getting an excellent introductory accounting and bookkeeping reference and I win by getting funds to help support development of additional accounting and bookkeeping tutorials and lessons. Ebook, Paperback, or CD Versions available! Why Buy My Tutorials ? but, a purchase while not required would be appreciated ! For a little fun watch my video Why Buy ? Learn to do by doing ! Not Free but reasonable ! Double Entry Accounting is my site providing those wanting to learn the basics of bookkeeping and accounting. Notice I said basics. The site is designed for those that don't want or need time consuming drawn out accounting and bookkeeping courses or tutorials and just want or need to become familiar with bookkeeping and accounting. In other words, a working knowledge. Free Bookkeeping Help and Bookkeeping Explained. I've tried to provide you with links to some additional excellent free accounting and bookkeeping training. What Do You Know About Accounting ? Wanting to check out how qualified you are for a bookkeeping job or just test your bookkeeping knowledge ? 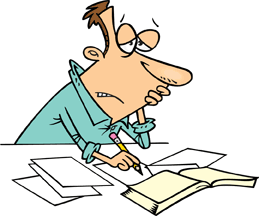 Check out my Accounting & Bookkeeping Skills Testing and/or My Bookkeeping Quizzes & Games. Accounting Lectures and Dave's Small Business Tips. Not needing a full-time employee but looking for a bookkeeper or an accountant for a special project ? Bookkeeping Hiring and You're Hired! Bookkeeping Job Search Guide. Needing To Certify Your Bookkeeping and Accounting Skills ? For those neededing certification of their accounting, bookkeeping, and computer skills, the following sites may be helpful. If you consider my site useful and you have a quality business related site consider becoming an advertiser and/or affiliate and make a few dollars promoting my accounting tutorials. Notice I said a few dollars - you won't get rich. Other ways you can help are buy my tutorials or a recommended product, link to my site, or make a donation. Get A T-Shirt and show that you now know what bookkeeping is all about. Explore the types of bookkeeping and accounting positions available and the necessary requirements. Explore schools near you providing programs in bookkeeping and accounting. Well they say an apple a day keeps the doctor away-well a few bookkeeping and accounting jokes can't hurt. I don't want you leaving my site empty handed ! Have a quality accounting, bookkeeping, or business related site ? If you enjoyed my site, please tell others !